The Basilica of San Lorenzo, heart of the homonymous Village, is one of the largest churches in the city. Other important monuments of the area are the Laurentian Library with its Cloister, the Medici Chapels with the Chapel of the Princes. The sheltered Market of San Lorenzo is the central market of the city. A few streets east of the market square there is the Santa Maria Novella railwaystation, Florence's central station, perfectly integrated into the urban of the historical centre. In Piazza Adua in front of the station there is the FlorenceCongress & Expo, convention centre and exhibition centre. 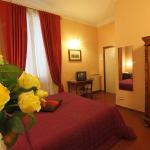 We are in the historic centre of Florence, therefore finding an accommodation of any category, is not a problem. Select travel dates and find all available hotels in Florence - San Lorenzo, check out guests reviews and locate properties on Florence city maps, book your favourite accommodation with no pre-payment. All rates are in Euros and inclusive of all taxes.